You probably know by now that iTunes 12.7 brings some notable changes like the removal of the App Store from iTunes, requiring users to manage and install iOS apps directly on an iPhone or iPad without iTunes on a computer. Similarly, the ringtone and Tones section has also changed in the latest iTunes releases, which some users may find confusing when they go to adjust ringtones on their devices. The good news is you can still copy and transfer ringtones over to an iPhone or iPad with iTunes 12.7, and as you’ll see it’s actually quite simple as you will see. You’ll need the latest version of iTunes as well as ringtone files in .m4r format to accomplish this task. 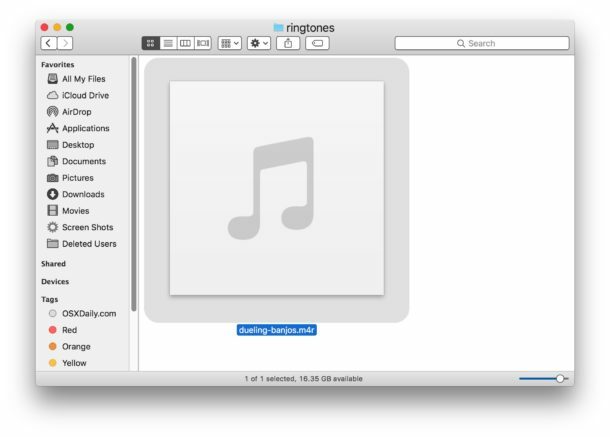 Note that even if you have installed iTunes 12.7 you will find the ringtone files are still stored locally on the computer as m4r files, much like .ipa files are, so if you had some custom ringtones before you can likely still find them locally. * Remember, selecting an iPhone or iPad in iTunes is done by clicking the little device icon in the top bar of iTunes now. As you can see, copying ringtones to an iOS device with iTunes is still quite easy. And yes you can still make your own in iTunes the same way as always and copy those over. This is kind of similar to using the drag and drop approach for copying music to iPhone in iTunes or even copying .ipa iOS apps to devices. 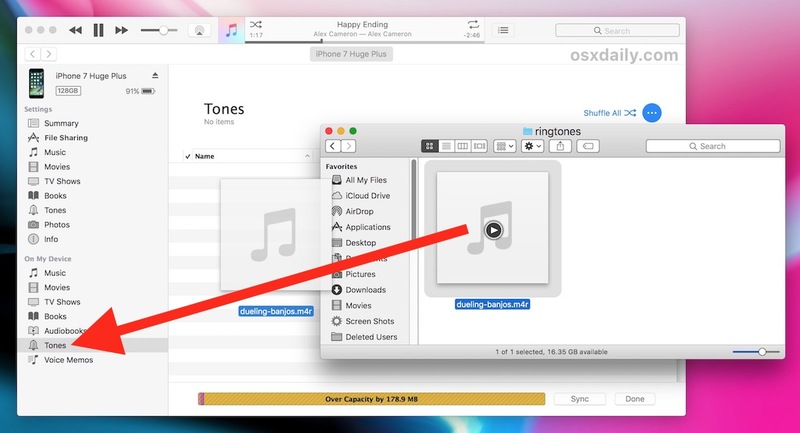 Another option that doesn’t use iTunes at all is to create ringtones on the iPhone or iPad directly in Garageband, which can be done entirely on the iOS device and never requires any kind of syncing or copying since the ringtone .m4r files are created and then kept on the device itself. Of course if this is too much of a bother, you can undertake a cumbersome task to downgrade iTunes 12.7 back to 12.6, though be aware that by downgrading you are likely avoiding the inevitable future of iTunes as well as iOS device compatibility. Amazing isn’t it? Apple the last few years making its computer users doing more and more clicks to do a task that used to be 1 or 2? Apple trying to be the Windows 98 in 2017. I think your complaint should focalize not on the “number of clicks” to do this task, but in the way Apple is “hiding” elemental tasks from a natural and ergonomic usage. My respectful view: I think this is a HUGE inconvenience for someone that has hundreds of ringtones/textones, etc. developed or purchased over years of usage and each used for special purposes or persons. The previous iTunes versions (12.4.3 & older for Windows) allowed this user to manage and identify each MP3.4r file MUCH more easily and quickly regardless of the number of clicks necessary. I’m certain that I am not a typical user but why completely eliminate this function? why not make it an option to have rather than eliminate it and make the user have to “reinvent” the whell on ringtones and such? I know onward/forward but at lease with something like elimination of the headphone jack on iPhones the alternative have the silver lining n that grey cloud of having the cordless headphone option, something of benefit (perhaps less quality/more compression albeit on playback) of no cords to get tangled in! The new iTunes V. also requires manipulation of programs on the phone device rather than on a iPad or laptop- for someone over 50 who is more visually impaired, this is not a benefit either! I’d be willing to bet there are other unpleasant surprises in store for this longtime Apple product user that will (definitely) inspire a serious look at manufacturer/product alternatives at this significant juncture. If it ain’t broke, take it away! Just wondering, has any one else had data loss on this last update to iTunes version 12.7? I’ve lost maybe about 150gb of music files (was about 700gb total) – first time this has ever happened to me – I’ve heard others have had this happened during other updates. I’ve been around since OS7. Fortunately, I’ve got a slightly outdated backup – I hadn’t backed it up about a year – but it’s taking forever to restore these files to my primary external disk where my iTunes music is stored. I’ve sent multiple “feedback” messages through iTunes documenting my situation – I hope somebody reads them (the form show the most recent OS as 10.3 and iTunes as 12.6.2 – the drop down menus are not up to date). In my case, albums affected either had been selected as ‘compilation’ in the info window or had ‘various artists’ on the album. The missing tracks appear with an exclamation point inside a circle. Upon clicking the track, iTunes ask if I want to locate the track and it’s nowhere to be found in the iTunes library. Very thankful I’ve got a backup but I can find no quick way to replace tracks except going album by album. Any suggestions on how to speed up the process? Yes, I lost all my customized ring tones, including a sweet recorded song by my then 4 year old daughter. I will never get that back again. This has got me thinking about leaving Apple. I’m confused. I’ve never done anything other than install apps for my iPad and iPhone from the App store. The main odd thing I used iTunes on the desktop for to match music from a CD to Apple’s database. This way, I didn’t have to buy the music yet again (in some cases, it would have made three times I bought the same thing: LP, CD then iTunes). Does that still work? I think I have most of my CDs matched but there might a few left. You need a CD drive. My old desktop (2012) has one. I understand new Macs don’t have them. Maybe iTunes match will no longer work? Any idea how to delete a ringtone from the iPhone once you install one? I cannot seem to figure that out. You have to do it from iTunes. Click “Tones” then select the tone and hit delete. A quibble: iPhone doesn’t show up in iTunes connecting by Wi-Fi, only using cable through USB port. It has never shown up as a device using Wi-Fi. If you haven’t enabled wi-fi syncing with iOS and iTunes then your iPhone will not show up over Wi-Fi in iTunes. Enable it in the summary settings area of iTunes with the iPhone connected. Dragging a file to the tones option in “on this device” does not work. Your phone is synced with a different iTunes library, most likely. I just had this problem and once I switched the phone over to the current iTunes, it worked. I’m with Sarah – dragging the file to the tones section does not work. fwiw – I have confirmed that I am running the latest versions of iTunes, iOS 11.0 [tho’ it didn’t work with the previous version either], and OS 10.12.6. And I rebooted both the computer and the phone after the updates. I’ve been trying to add a 4-second clip of Lurch saying “YOU RANG?” as a ringtone since I got my iPhone 6 a coupla years back. (It only took 10 seconds on my old Motorola Razr.) Oh well. The ringtone must be .m4r ringtone format, and it must be dragged into a synced/connected iPhone into the “On My Device” list. It works, that is how you transfer ringtones to the iPhone now. Dear iut – thanks for your reply; I’m pretty sure I did that yesterday, but just to be sure, I did it again just now. I’m having the same issue. Tried to copy the files several different ways. Yes, all my files are .m4r! What I’ve found is that ringtones that have cover art associated with the file will NOT copy over. The 2 tones without cover art DID. How weird is that? Know how to strip the coverart from a ringtone file? Unfortunately this drag and drop will not work for me, neither will add files, etc. I have double checked every step and all my ducks are in a row. Still, I get a ‘no symbol’ when I drag it over to my device area. I can’t drag it into itunes screen at all without getting the no symbol. UGH!! Why does itunes screw with stuff constantly? All I figure is they want us to pay for ringtones instead of making them. This is how you transfer a ringtone to the iPhone in iTunes now Jason, this is how Apple tells you to do it as well if you contact support. Amazingly it works for everyone but you. That means you are experiencing classic PEBCAK, Problem Exists Between Chair And Keyboard, also known as the human – you. That’s a rude response… I have the same issue: when I try to drag my m4r file over, I get a “no” icon. It’s ludicrous. If jason is the only one it doesn’t work for then I am the same person as jason. The file is m4r and has been synced with my iPhone 6 on previous versions on iTunes with ZERO issues in the past. I would appreciate some help without the snark. How arrogant. This did not work for me either, as well as many, many others. That’s an extremely arrogant response. If you’ve done a little research you’ll see that this problem is widespread. I have the same issue. The Drag and Drop method just isn’t work. it works for 4S and 5S, but for the 6S I get the exact same symptoms as Jason. Have been using Macs since 1987, so am not a spastic or newbie!!! since the person writing the article was rude, i figured out the solution for you. you can not drag and drop the m4r files while the iPhone is syncing. Either wait for the sync to finish or (like I did) stop the sync and drag the files over and then restart the sync. I hope this helps. That is correct, you drag and drop the tones file over (must be .m4r format) while there is no other syncing activity going on. You can not copy a ringtone or app or anything else to an iPhone when the device is busy syncing with iTunes. If you connect to iTunes and don’t auto-sync it will be no problem. THIS WORKED!!! Thank you, Ellie!!!!! To counter the rude response I have a solution. You do not drop the files in the left window but the right window of TONES. Select the files. Click the TONES folder. Drop onto the right window not the “TONES” icon on the left. It works.\Hope this helps. Be nice to people, not snarky. Sorry, this didn’t work either. It doesn’t work, weird, I have the same .m4r files, it works for my iPhone7, but it doesn’t work for my new iPhone 8 Plus. Those who have the same problem, what phone do you have ? I have the regular iPhone 8 but I couldn’t get mine to drag either. I right clicked on my file and then hit control V in the iTunes to paste it and it worked!! I hope this helps someone! Holy crap this worked! I’ve been scratching my head for hours on this. Thanks for the tip! Yes, the old classic copy/ ctrl V worked. Thanks guys! Copy and Paste worked!! Thank you so much!! Bless you!!! That finally worked!! OK, I got them to show up under Tones, but after I synced, they were all lost! Except for the ringtones without coverart! Fiiinaaaaaally!!!!. This worked for me with a caveat. I tried control V about 1 million times with nothing happening till i figured out that on a Mac computer it’s “command” v. Thanks a lot. THIS finally worked!!! Thank you for posting this! None of the dragging and dropping worked, and of course, neither did “Control V”. But copying the file in my Finder window where it was located and then making sure iTunes was selected and hitting “Command V” worked instantly. And yeah, that other person’s reply to Jason was stupidly rude. Hallelujah! I have tried for hours today to recover my ringtone that I made years ago and mysteriously fell off recently. I tried C & V so many times but think the fact that the phone was syncing (could’nt halt it either without actually physically switching phone off) but in the end hey presto Command V onto the device did the trick. What a palaver. Hooray for forums. Apple’s ‘help’ is pants! I’m glad this worked for you Karen and you were able to copy and paste your ringtones onto your iPhone. You should be able to drag and drop but I can’t figure out why some people must copy paste instead… curious iTunes! THAT WORKED. Nothing else did. THANK YOU. Amy, you’re a star. I’ve been trying for over a week to get ringtones copied onto my iPhone 6 until I saw your post. Amy – fantastic! It worked. Thank you for not giving up on us folks that clearly “suffer” from “PEBCEK.” Maybe we suffer from something else, eh? the keyboard shortcut cut/paste worked for me. many thanks. much more helpful than that arrogant p#*k Egon!! I’ve experienced this same thing. I can drag n drop into my phone then sync, but when I look at my phone, nothing is there. What the heck is going on? Same thing! Some of my files copied over fine and some just show up grey with the dotted circle on the left. I kept trying b/c I didn’t know what else to do and the grey version just multiples. I tried comparing files to see why some work and some don’t but I can’t figure it out. Driving me crazy. I was having this same problem, but I solved it. First, drag and drop didn’t work at all, then I changed the settings in “Summary” to “manually manage videos” and clicked apply. Now I could drag and drop the m4r file into “Tones” but it only showed up grey with a dotted circle and wouldn’t appear on my phone even after I hit sync. Here’s the solution I found: Don’t drag and drop the ringtone, copy and paste it. That’s it, it was that simple. Spent a long time trying to figure this out but hopefully this info helps others. except I deselected it, as it was already selected?! Same problem here. .m4r file dropped at tones folder but greyed out and not synced to my iPhone. I’m having the same issue – I’ve got about 5 ringtones I’m trying to bring over, all are .m4r – only one transferred with no problem. the others just keeps saying it was not copied bc it can’t be played on my phone. Anyone here who can give the solution? Drag and drop didn’t work for me in Windows but CTRL-V did. Thanks Amy! I had the same drag and drop issues as Jason and others. I was creating ringtones in the editing software, Fission. What worked for me was updating the Fission software. Drag and drop then worked flawlessly. For what it’s worth, I opened the iPhone symbol, opened file sharing and then ringtones. There were all my ringtones there. I dragged and dropped into desktop and from there dragged and dropped into the tones section ‘On my device’. sync! Lots of cheering after faffing about for over an hour. Thanks for everyone’s ideas and guidance. Drag and drop didn’t work, NOR did the copy and paste into the Tones folder in On My Device that seems to work for everyone else. its work,, then how to delete it? Yes I’d also like to know how to delete. Thanks Amy; copy and CTRL V works with Windows 10. Easier than my prior method! Dragging & Ctrl+V are not working for me on ip7 (11.1 beta 2) and Windows 10. Copied files are grey. Vry frustrated. My 5 ringtones which I have been using since last 5 yrs, gone. Same here — iTunes tells me my iPhone couldn’t play m4r files. But weirdly, this is only true for files created in the new version (12.7.166 I think) of iTunes… This is rubbish and frustrating! Just to add my voice to others’, this just plain doesn’t work. And there’s some pretty rude responses to the many people saying it doesn’t work for them either. And yes we all followed the simple instructions. Anyone know a way to do this that actually works? And to the author of all this, please don’t just respond and say this works. It doesn’t work. We want a way that works, not one that doesn’t work. Thanks. I was having the same problem as everyone else when I accidentally dragged it to the DEVICE instead of the tone folder! it worked!! iTunes wants to decide which folder to put it in!! Never would have figured that out. What do you know? It works, if you cut the song in Garage Band to max 38 seconds. Bernd M. Schell was absolutely right. If the file is longer than 35 ~ 38 seconds, iTunes will reject it. Then click File, Export, and save as an Audio File, appending “.m4a” (no quotes) to the file name. Once you’ve done that, edit the file and change “.m4a” to “.m4r” (no quotes). Once you’ve done all that, simply drag your .m4r file into iTunes 12.7’s “On My Device” panel in the bottom left, and it will instantly add it for you! Thank you for your very clear and easy instructions! I have been having the same issue with all of you, I tried to drag and drop but it does not work. 1. select your device and scroll down to the “OPTION” section in SYNC interface. 2. look for “manually manage music and videos”, make sure you tick the box. after I did that, the drag and drop to the “Tones” on the device work for me. Hopefully, it works for all of you too. Just picked up an X today and this is the only problem I’m having. Neither Drag and Drop nor Copy and Paste are working for me. I’ve tried doing it after a sync or having the sync stopped. No go. My option on the summary is only “Manage Videos Manually,” no music. I think this is because I subscribe to Apple Music and I’m wondering if that’s part of the problem here. i am in the same boat as you. i also subscribe to apple music, and when i attempt to check the box next to “manage videos manually” (i don’t have a music option there), it gives me a scary message, so i click cancel on the message box. i would really like to add in my custom ringtones, as they were for my alarm clocks. Doesn’t work. 12.7.1.1.4. Yes, I followed the instructions. Yes, I know what I’m doing. And, no, it doesn’t work. To clarify: iTunes thinks the ringtones have been loaded to the phone. They haven’t. One point. Using iTunes 12.7.1 and iPhone 7Plus. Laptop has High Sierra. Drag and drop does not work for me. After trying to get this to work for a week I called Apple. You must COPY AND PASTE. Worked like a charm. So i’ve finallygotten the files copied into the ringtones section of iTunes under on my device, THANKS. BUT I can’t get them to show up on my phone. I sync and nothing seems to transfer. please help! Guys I spent more than two hours figure things out. Here is the thing the new window 8 up kinda hide the extended name of the file. So, if you just rename by removing .m4a and changing to m4r. That is not gonna work. You go to “View” on the taskbar of the window browser (I don’t know what to call it.) > Folder Options > View > UNCHECK hide extensions for unknown file types. So you will see that ahaaa it is still .m4a not truely .m4r as you actually saw on file name. Hope this help. I’ve literally done all these steps and nothing works. copy paste, drag and drop everything. It seems that it works and it does not. how do i get it to finder if it’s already on my phone and I want to put it on the my so i can transfer to other devices? I don’t know if anyone else has had this behavior, but on iTunes 12.7.3.46 on macOS 13.3, I was able to sync the custom ringtones I had added to a prior version of iTunes a long time, but not new .m4r ringtones that I just purchased from a third-party provider, cleartones.net, recommended by MacPower Users. I tried all the incantations suggested here (drag-and-drop to the icon, to the window, etc. ; cut-and-paste; “manual manage” suggestion, etc. ), all with no luck. These new .m4r files always show up in gray with the I’m not sure whether the problem is the new .m4r files or whether iTunes performed some technological equivalent of “grandfathering” in the old custom ringtones I had in prior versions of iTunes. – The problem is not simply the ringtones, because I was able to successfully load these ringtones to other iOS devices from the same computer. I can’t upload to my iPhone X, but can to my iPads. – The problem is not simply the iPhone X, because I was able to upload some old ringtones (a mix of ones I made and those I downloaded, all of which used to be part of my iTunes library before 12.7). I just can’t load these new ringtones to the iPhone X. – The problem is not simply the iOS version, because the two iPads to which I successfully uploaded the particular ring tones are running the same iOS version as the iPhone X (v11.2.6). – The problem is not simply my computer configuration, because the same macOS 13.3 computer running iTunes 12.7.3.46 was able to upload the ring tones on to iPads, but not the iPhone X. I also tried another macOS computer (same versions of macOS and iTunes), and it didn’t work on that device, either. – The problem wouldn’t appear to be my Apple Music subscription because it didn’t work even after completely logging the iPhone X off of iCloud entirely. Bottom line, there is some weird convergence of iTunes 12.7 and (a) a particular iPhone; and (b) particular ringtones. This sort of annoying bug is not what I’ve grown to expect from my Apple ecosystem. It did not work for me as well, but solved my issue. I hope it mey help the rest of you as well. I stripped the m4r files of artwork, artist, album, etc… I only have a title and a value for “kind” so I can organize them together in the library. Once I stripped all artwork and band/album/year etc… the drag/drop worked. I hope it does for you as well. this solution was the key for me, thank you. i was confounded for two days. i discovered i didn’t need to remove ALL information, but there’s no harm in deleting everything. i don’t know how else i would’ve solved this issue, and apple should be embarrassed for not putting in a simple fix. i do love apple products, but iTunes (to me) comes off as amateur hour. great job. Hi, all. I have been having the same issue transferring custom ringtones from my Mac to my iPhone 8–both running most recent versions of OS with the latest version of iTunes. What I’m finding is that when I send the ringtone from Garage Band, rename it with the m4r extension and then put it into the device section: ringtones: it sends over a file called ringtone template. It doesn’t matter what I’ve called the file in the first place. What shows up on my phone is ringtone template. So, in future attempts to copy/paste, drag/drop–the file is still called ringtone template and so I can only add one tone. I have followed all the suggestions here and have spent lots and lots of time on the phone with Apple Accessibility–I happen to be blind. I’m still dealing with this ringtone challenge and hope to find the answer today about the filenaming issue. I have been using itunes for years now. It has been pain in the a**! Nowadays i can drag n drop songs to my phone (still this is retarded cause, this itunes is basically just unnecessary compared to just file based dnd) Now i tried to add new ringtone, cause how hard it can be? How wrong I was, how wrong? 2 hours trying, reading instructions, trying, trying, trying. Im done with this s*************. First thing in the morning im gonna crack the crap out of this god forsaken device!